It’s officially the height of summer! I’d say something like, “go outside and enjoy this weather,” but here in DC it’s so swamptacularly humid I’d rather stay in and build Gunpla. If you live in a similarly unsuitable climate, there’s fortunately plenty to do indoors. From Gundam Wing and Endless Waltz finally coming to Blu Ray, to Funimation licensing Iron-Blooded Orphans, there are plenty of new releases to watch. And, it turns out, there are plenty of new Gunpla to build, too! Let’s check them out. P.S. 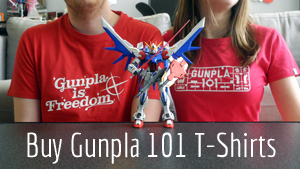 If you are thinking of braving the heat here in DC, Gunpla 101 has a panel at Otakon called “Gunpla Is Freedom.” Stay tuned to find out more! Let me know if you have any thoughts/corrections/deals in the comments. See you next month!